Here you’ll find travel reports about Provisor Island. 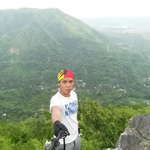 Discover travel destinations on the Philippines of travelers writing a travel blog on FindPenguins. Up at 6.30am to head to the airport. Had less of a lunatic driver this time! After I had checked in, grabbed some pancakes and coffee and settled in for a bit of a wait. Set off on time for Manila, arrived half an hour early. Got through the transfer surprisingly quickly and found myself at the gate crazy early. The flight ended up being an hour late so I had a long wait. Eventually landed in Iloilo at about 8.30pm so was about 9.30 by the time I got to the house. Had some food waiting for me and had a quick tour of the house. Shown to my room where I am staying with Kirsty and Claire who are both nice nursing students but only here until Saturday so then I will have the place to myself!